Trade-Based Money Laundering is an authoritative examination of this burgeoning phenomenon, now coming under scrutiny in the War on Terror. This book walks you through the signs and patterns of trade-based money laundering (TBML) to help you recognize it when it occurs, and shows you how data and analytics can be used to detect it. You'll learn the common value transfer techniques including invoice fraud, over-and-under invoicing, and misrepresentation, and learn why analytic detection systems have yet to be implemented despite the existence of copious data. Case studies from around the world highlight the real-life implications of the concepts and processes presented in the text, giving you a first-hand view of the mechanisms at work inside this expanding illegal market. Trade-based money laundering uses trade to convert large quantities of illicit cash into less conspicuous assets or commodities to evade financial transparency laws and regulations. As an ideal funding mechanism for terrorist groups, the practice is getting more attention even as it increases in scale and spread. This book takes you deep inside TBML to better arm you against its occurrence. According to the U.S. State Department, TBML has reached staggering proportions in recent years, and is considered by many to be the next frontier of international money laundering enforcement. 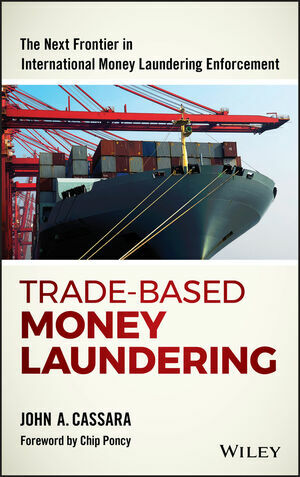 Trade-Based Money Laundering gives you a battle plan, with expert insight and real-world guidance. JOHN A. CASSARA is an expert in anti-money laundering and counter-terror finance, with special expertise in money laundering in the Middle East and the growing threat of alternative remittance systems and forms of trade-based money laundering and value transfer. A 26-year veteran of the federal government intelligence and law enforcement communities, he is an industry advisor for SAS, as well as author and co-author of numerous articles and books.